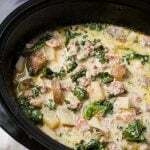 Crock Pot Zuppa Toscana Sausage Potato Soup is rich and very flavorful. With sausage, potatoes, bacon, & kale. A tasty, easy slow cooker Zuppa Toscana soup. I can eat soup any time of the year. With my Crock Pot, I don’t have to keep track of the timing so much, as it cooks all day and is ready when I need it to be. In the summer I can make this soup without adding to the heat in the house. Slow cooker soups are wonderful! Zuppa Toscana translates to “Soup in the style of Tuscany.” I think this version has strayed from the real Tuscan version as there are no beans or celery, and a few other missing ingredients. Trust me, it doesn’t need anything else. Though it is pretty simple, the flavor and richness is incredible! Many of us have had a version of this soup at the Olive Garden restaurant. 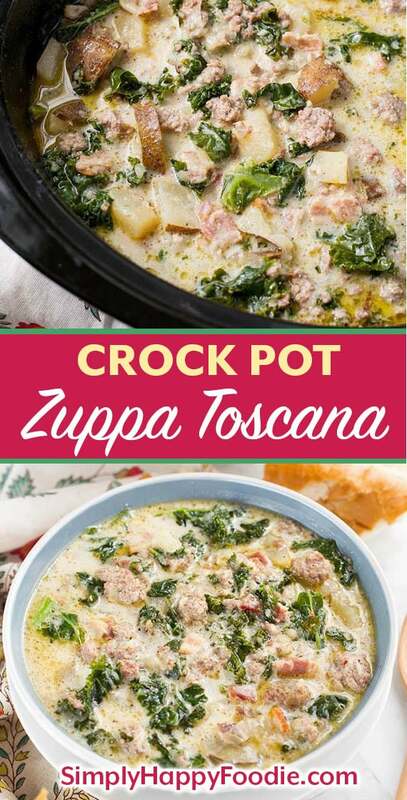 This Crock Pot Zuppa Toscana Sausage Potato Soup is my favorite soup in the world. It became popular when the Olive Garden restaurant started serving it. My Crock Pot Zuppa Toscana is a little different, because I think it has more flavor, and is a little more hearty. 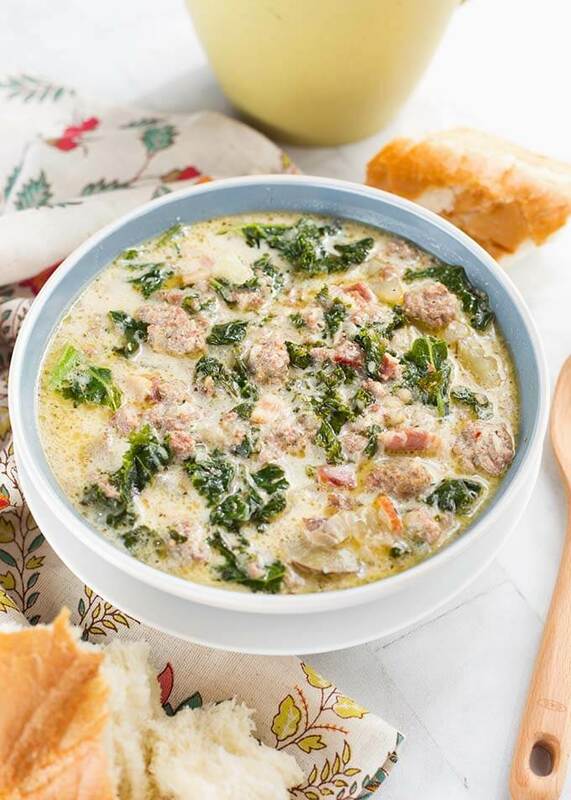 I like to use hot Italian sausage as it gives this Crock Pot Zuppa Toscana Sausage Potato Soup just a kick of heat. It also has more flavor. You can use a mild sausage if you prefer, it will still be good. 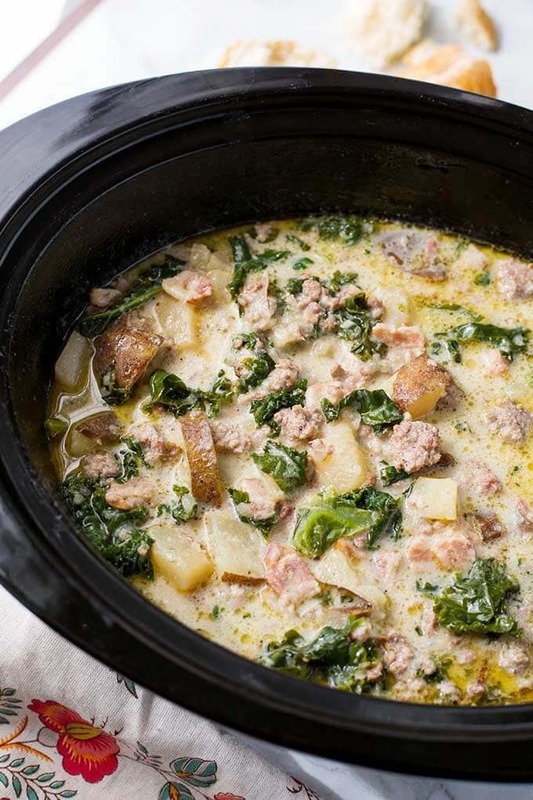 This slow cooker Zuppa Toscana Sausage Potato Soup is really wonderful! 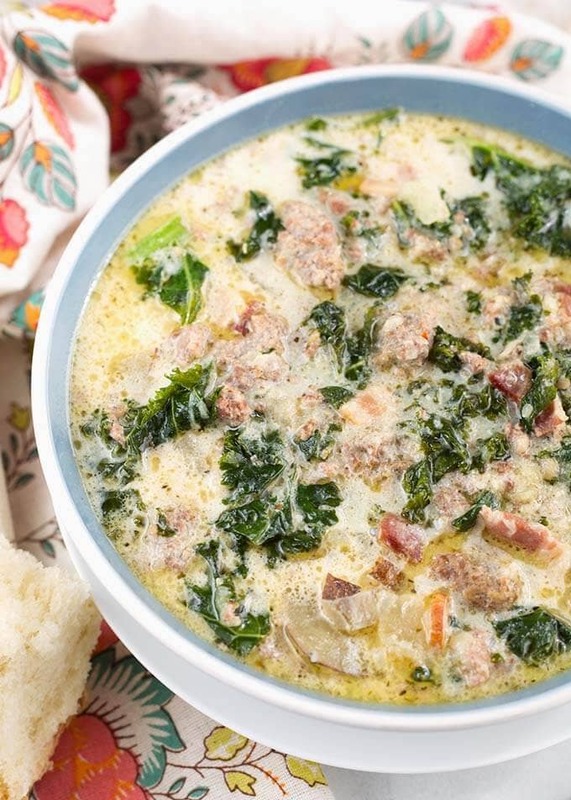 Crock Pot Zuppa Toscana Sausage Potato Soup is rich and very flavorful. With sausage, potatoes, bacon, and kale. A tasty, easy slow cooker Zuppa Toscana soup. In a frying pan, brown sausage, bacon, and onion together until onion softens and meat is browned. Then add mixture to the crock pot (6 quart or larger). Add garlic, oregano, and pepper to crock pot and stir. Add potatoes and broth. Stir. Put the lid on and cook on High for 3 1/2 hours, or Low for 7 hours. When cook time is up, finish by adding the chopped kale (or spinach) and the cream and stir. Put the lid back on and let heat through for another 15 minutes on High, or 25 minutes on Low. This is the best soup! I added 1 extra cup of broth because I wanted it more soupy. Also used half-n-half instead of heavy cream because that’s what I had. Everyone loved it! Hi Nancy! I’m so glad everyone loved this soup! Thank you for your review! Hi. I’d like to make this recipe in an Insta Pot. Do you have any recommendations for cooking times? First time having zuppa toscana and when I say this Recipe was a hit …. only thing is I replaced the Italian sausage with hot Italian chicken sausage… super easy to do no mess to clean up!